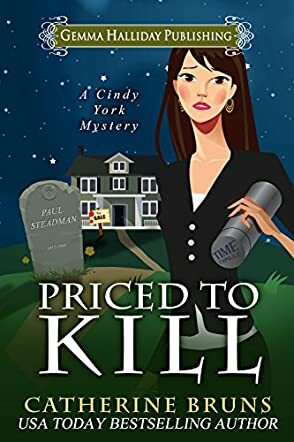 Priced to Kill by Catherine Bruns is an exciting sleuth mystery that will keep the reader on the edge of their seat. Cindy York, a struggling real estate agent, receives an unsettling phone call from an estranged friend from her past. She is invited to a dinner for her twenty-fifth high school reunion, being held at the mansion where Cindy had discovered her best friend covered in blood. She had not returned to it since that day, nor had she any desire to go there now, but accompanying the dinner invitation was an invitation to add the mansion to her listing. Because the prestige of having such a valuable listing would be a profitable boost for the office where she is employed, she accepts. Reluctantly, Cindy attends the reunion, accompanied by her best friend and boss, Jacques. While dessert is served, the Senior Class Time Capsule is opened and hidden within its contents is a letter written to Cindy by her friend the day before he died. The stunning information sends Cindy and Jacques searching for the culprit of a twenty-five-year-old murder. Priced to Kill by Catherine Bruns kept me on the edge of my seat until the final page. I thoroughly enjoyed reading a book with a happily married heroine who maintains a family alongside her sleuthing. Her family issues are realistic and make a good background for her character, adding to the drama that is unfolding, and combining Cindy's sorrowful past with the present. I fell in love with her boss and best friend, Jacques, and found his character to be delightful. Although Cindy can be flighty and a little clumsy, Jacques balances her out. The surprise in the end has me looking forward to future sleuthing with Cindy and Jacques.